En route to the first two Super Bowl wins in the 1960s, I recall three factors about Vince Lombardi’s Green Bay Packers – they were intense, skilled and balanced. A fourth factor – they kept it simple. Even as a kid watching them on CBS, I could almost always anticipate their plays depending on the situations they faced. By keeping it simple, there were no turnovers — this helped guarantee their success as they strongly executed their strategies. 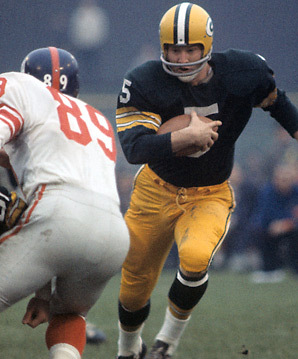 Paul Hornung was a complete player – a star halfback who also kicked field goals and passed for touchdowns — on a team of stars. Called the “Golden Boy,” he was a source for great metaphors in business. He was called to duty in the U.S. Army in the 1961 season. But somehow he was able to play on Sunday in the NFL championship game vs. the New York Giants. He was named the game’s MVP as the Packers won 37-0. Later, we learned why he was allowed a pass by the Army to play in the game. Coach Vince Lombardi knew President John F. Kennedy, and the president later said he want the best teams to play in the championship game. Two years later, the flamboyant star was suspended indefinitely for gambling on games. But Coach Lombardi’s influence in the league and a contrite Hornung made his return possible sooner-than-expected the following season. Again, it was a lesson in networking and honesty for businesspeople. As often is the case, sports offers lessons on strategic management and planning. The NFL provides great metaphors for business success. Many businesspeople also know the importance of becoming stronger by teaming with others. By combining resources, companies succeed in meeting the needs of customers. All such traits – passion, best practices, simplicity and strategic partnerships – contribute to winning in business. That’s why success stems from what you know – and whom you know – helps a business to be stronger in taking advantage of opportunities for growth via management, marketing and stability. Naturally, to attract strategic partners, it’s important to be an attraction. 1. Take an inventory. Evaluate your strengths and weaknesses, which have to be improved upon. You should demonstrate positive financials, stability, and vision. 2. Analyze your potential partner’s and alliance opportunities and threats. 3. Develop benchmarks. Determine in advance how you will measure success. 5. Consider it an investment of your time and resources. Remember the Golden Rule. Take it seriously if your partner is to take you seriously. 6. Create a paper trail. Both parties must know what’s expected, how they’ll benefit, and if they do. 7. Leverage expertise of outside participants. That includes a mentor and professionals who understand the industries of both partners. 8. Make communication a key component of the relationship. Not via e-mail or telephone, but in-person visits. 9. Seek constant, ongoing improvement. Fine-tune as you go. Oh, and make sure your strategic partner adheres to the nine standards. Helpful Career, Biz Tips from UCLA’s Longtime Broadcaster — Here are career tips for young broadcasters, businesspeople from the longtime UCLA play-by-play announcer, Chris Roberts. Los Angeles Radio Sports Anchor Shares Career Insights — For my money, Randy Kerdoon is one of the more unique persons you’ll ever meet. If you follow his tweets (https://twitter.com/#!/knxrandykerdoon), you’ll see he’s got a great sense of humor, which can be misleading.